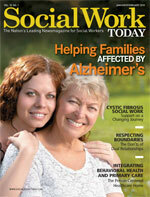 It’s been 10 years since the Geriatric Social Work Initiative (GSWI) was launched, and it’s come a long way in that decade. There’s no doubt the GSWI has been responsible for many important changes, but despite the significant inroads made, there is still much left to be accomplished. The initiative was developed to address a growing need for aging-savvy social workers as the number of older adults continued to rapidly grow and diversify. It focused on the fact that an increasing number of social workers found themselves working with elders but lacked the training and skills to address this group’s specific needs. A look at the educational programs being offered revealed an insufficient number of courses related to aging. Thus, the GSWI emerged as a multifaceted initiative with various components that would address some of the necessary changes. The overall GSWI contains four individual initiatives: the Hartford Faculty Scholars Program, the Hartford Doctoral Fellows Program, the Hartford Partnership Program for Aging Education, and the National Center for Gerontological Social Work Education (the Gero-Ed Center). The latter, directed by coprincipal investigator Nancy Hooyman, PhD, promotes institutionally driven changes in foundation curricula and social work programs while developing policy initiatives for the broader adoption of gerontological educational resources. Hooyman, who is also an endowed gerontology professor and dean emeritus of the School of Social Work at the University of Washington, says that in the five years since it opened, the center has had a tremendous impact on faculty and programs nationwide by changing beliefs. She says the center has helped progress beyond the stage of having to convince people that aging is important and into a realm where its importance in the curriculum is no longer questioned. Hooyman says one of the biggest challenges faced has been addressing student perceptions, not faculty. Many still have ageist attitudes and don’t consider gerontology as a field they’d like to pursue. “It doesn’t help that aging concentrations tend to be the smallest, if an institution even has that concentration or specialization in the first place,” she adds. There have been many other indications of success in the last decade. The Hartford Doctoral Fellows Program has emerged as an important component of the overall GSWI. It provides financial support and professional development, helping prepare future leaders for a tenure track faculty position at major universities. “The mantra I often cite is, ‘Today’s doctoral students are tomorrow’s faculty,’” says James Lubben, DSW, MPH, the program’s principal investigator and director of the University Institute on Aging at Boston College. The program was a response to the decline in the number of doctoral students choosing gerontology for their dissertations. In 1999, there were only 15 students majoring in a gerontology graduate program in the entire country. “In 2007, there were more than 30, which is a remarkable increase but still small compared to the needs,” says Lubben.